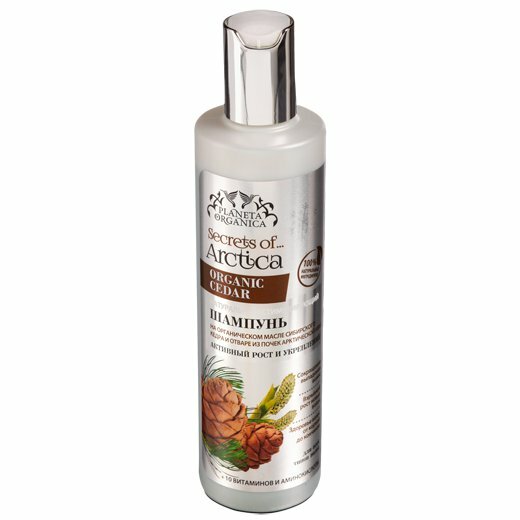 Siberian Pine Shampoo is produced by the Russian beauty brand Planeta Organica for its Secrets of Arctica series. It is designed to stimulate active hair growth and strengthen your hair. The product is suitable for all hair types. Siberian pine is able to withstand even the harshest frosts. Its incredible will to survive is preserved in cold pressed pine seed oil extracted from pine nuts. Pine nut oil is extremely rich in essential unsaturated fatty acids which are important for hair health and beauty. Fatty acids, vitamins and minerals contained in the oil nourish hair follicles, stimulating hair growth. They also strengthen your hair and prevent excessive hair loss. The shampoo also contains Arctic willow bud decoction rich in vitamin C and other useful substances. Vitamin C is a natural antioxidant that prevents hair damage and helps to repair already damaged hair structure. Amino acids and vitamin microcapsules enhance the product’s stimulating effect and make your hair noticeably stronger and healthier. Ingredients. Salix Аrctica Bud Water, Organic Pinus Sibirica Seed Oil*, Sodium Coco-Sulfate, Lauryl Glucoside, Sodium PCA, Sodium Lactate, Arginine, Aspartic Acid, PCA, Glycine, Alanine, Serine, Valine, Proline, Threonine, Isoleucine, Histidine, Phenylalanine, Cocamidopropyl Betain, Biotin, Folic Acid, Cyanocobalamin, Niacinamide, Pantothenic Acid, Pyridoxine, Riboflavin, Thiamine, Yeast Polypeptides, Tocopherol (vitamin Е), Sodium Chloride, Organic Calendula Officinalis Flower Oil*, Organic Aralia Elata Root Extract*, Kathon, Parfum. Want to buy Siberian Pine Shampoo? Call us or submit your order via our web site! Planeta Organica Secrets of Arctica is a cosmetic line produced by the well-known Russian beauty brand Planeta Organica. The products of this brand are known and loved not only in Russia but in Ukraine, Kazakhstan, Armenia, Georgia, Latvia, Lithuania, Moldova, Belarus and other former soviet republics. The company specialises in the production of cosmetics formulated with natural plant ingredients. Planeta Organica offers several cosmetic series based on natural plant extracts and oils from different regions of the world. Its Arctic series is one of the most recent, it was developed in 2014. The products that make up this series are based on wild berries and herbs that grow in the harsh climate of the Arctic region. Due to low temperatures Arctic plants have to accumulate more nutrients than their southern counterparts in order to survive. That is why northern plant extracts and oils are extremely rich in biologically active substances. Planeta Organica Secrets of Arctica offers a wide selection of beauty products designed to take care of your hair and skin. They include, but are not limited to, cleansers, creams and masks for all skin types, eye skin care products, body care products, shampoos and hair conditioners. The specialists of Planeta Organica are especially proud of valuable and rare 100% natural oils extracted from Arctic cranberry and cloudberry. It took the specialists of Planeta Organica almost a year of hard work to develop the Sercets of Artica series (327 days, according to the company’s official representatives). All this time the company’s team had been looking for the most useful ingredients, developing the most effective formulae and thoroughly testing the finished products. And today the powerful healing potential of Arctic plants is available to you in convenient and attractive bottles and tubes, ready to make your skin and hair look healthy and beautiful.